I commissioned this sketch of Dawn from an artist I found online. Dawn is the lead character in the book I’m working on now- Dawn Rising, set in my Jabbler’s Mons fantasy universe. 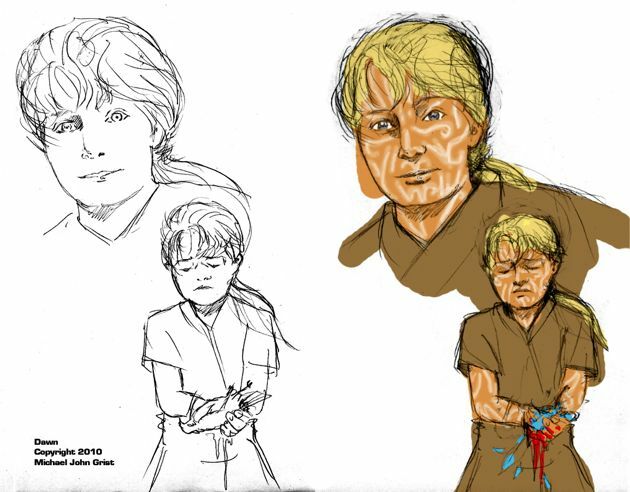 The artist took a few passes at rendering Dawn and his scars, but in the end unfortunately gave up before finishing, so the image at right is what I’m left with. His scars look a little too much like war paint, but otherwise I think this is close to what Dawn (he is a boy, yes) looks like. I’m talking to a few other artists now about rendering some of the other characters from Dawn Rising. One chap is going to produce a big epic battle scene- drawn from the various heroic stories that Dawn is reading at the beginning of the book. Another will hopefully complete a digital painting of Dawn, and of his 5 friends, and maybe other characters too. It’s exciting for me to see my characters rendered like this. It makes them real, and easily accessible, even though the book itself is not fully finished. So these are tasters only, ones I hope will draw people in to learn more about the world and the story. The scene depicted above is Dawn’s opening scene. Jabbler’s Mons is the name of the city Dawn grows up in. I’ve had several short stories set in that wider fantasy world published in fiction magazines- you can read more about them on my stories page. You can learn more about Dawn Rising there too. Cool beans about the art!! I got yer email and will be reading, but I’m replying here because for some reason Gmail won’t let me send email at the moment. I think (hope!!) it’s a temporary issue.